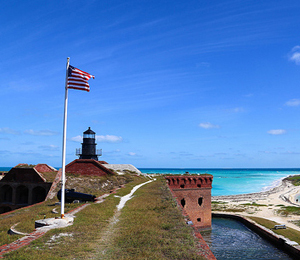 In July of 2001, the Dry Tortugas National Park got an added title. It became the country's first true Ocean Wilderness area, giving it full protection as a world-class environmental reserve. As a national park, the Tortugas saw a certain amount of protection, such as a strict limit on commercial fishing in the roughly 200 square miles that make up the ocean-island park of the Dry Tortugas. Now, through the Tortugas Ecological Reserve that is overlooking the new christening and added protection to the area, the Dry Tortugas will see extra protection that many environmentalist say is essential the protection of the islands, their surrounding areas, and the delicate coral reef formations found on the ocean's bottom. The Dry Tortugas is one of the most intricate island-water ecosystems in the United States. It is one of the top locations for spawning areas for reef fish, for instance. Other important and sometimes endangered species that make the Dry Tortugas their home include grouper, snapper, and spiny lobster. The current that goes through the Dry Tortugas sends many of these spawning creatures as far north as Georgia, making this area important for a much larger area and ecosystems throughout the Southeast United States. In the years leading up to the area's status as a protected Ocean Wilderness reserve, there was increase in commercial fishermen in the surrounding areas of the National Park, as well as improved navigation through the area and an increase in recreational fishing from small, private boats. Thanks to the efforts of Gail Norton, the then-Secretary of the Interior, the Dry Tortugas is now the third protected coral reef area in the whole world. This move is hailed by nature enthusiasts and Dry Tortugas lovers because it will ensure that the area remains as untouched and pristine for generations to come, keeping America's most unique national park open to visitors for many more years.